A new team of special constables and volunteers has been introduced by Leicestershire Police to improve road safety and law enforcement in the region. 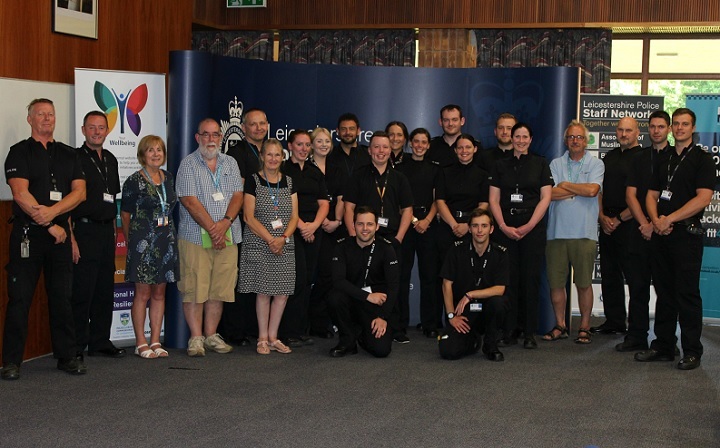 The ‘Safer Roads Team’ was launched at the forces’ headquarters on 28 June and comprises 18 special constables and four police support volunteers. The team was briefed by Leicestershire Police’s Roads Policing Unit (RPU), ahead of carrying out a variety of operations to target traffic offences, including the ‘FATAL 4’. ‘FATAL 4’ offences are those ‘most likely to cause death or serious injury’ and cover drink/drug driving, speeding, using a mobile phone behind the wheel and the non-wearing of seatbelts. The Safer Roads Team, which will be supported by the Leicester, Leicestershire and Rutland Road Safety Partnership, will also work in collaboration with local councils, the DVLA and TISPOL (the European Traffic Police Network). The idea for the team came from similar initiatives led by Lincolnshire and Northamptonshire Police. Richard Smith, a police support volunteer on the Safer Roads Team, said: “My main role will be ‘spotting’ for the team. Special constable Alison Rudkin,who is also part of the Safer Roads Team, said: “After being a special constable for two years I feel this is a huge opportunity and something I really want to get involved in. It’s not difficult to spot bad behaviour on the roads Sandy and the more people that can be enlisted to do this, the better. A uniformed officer, whatever their status or rank, or even someone in a hi-viz at the side of the road is enough of a calming influence on the driver and the authority that goes with it is enough to get a firm message across – it isn’t rocket science anyway. As I’ve said elsewhere, if it improves behaviour and prevents a collision, then it’s justified and no..before you ask, it can’t be proven, apart from feedback from those on the receiving end. Part time, free bobbies are just as viable as the real thing as they hold a warrant just like full time paid ones so don’t denigrate them. They come if for enough stick within the service without others in road safety having a go at them. For many years now speed vans have been occupied and cameras used by civilian staff and thousands of successful prosecutions have resulted. For years civilian traffic wardens who have nothing to do with the police have been reporting unlawful parking and they have also made many prosecutions. So there is nothing new in using civilians in order to enforce the law. I for one applaud this effort. Firstly the use of ‘Hobby Bobbies’ & ‘Specially Trained Volunteers’ speaks volumes as to how seriously ‘Leicestershire Constabulary’ take Road Policing! The use of individuals with 10% of the training & 100% of the power is another indicative of what Law & Order in 2018 England, and the wider UK in general now means. I am totally aghast at this proposal, and see it as the creeping use of ‘free labour’ to use ill trained personnel to police this country? I don’t care if it’s wrapped up in a ‘road safety’ disguise. This is an abuse of authority & misuse of ‘Specials’ who were never meant to replace police officers, but augment regular police officers, under their direct guidance & supervision. Also power has a nasty habit of corrupting those less used to wielding it. I’m not even going to discuss ‘Specially Trained Curtain Twitchers’. If it wasn’t so serious it would be laughable. What next? Neighbourhood Vigilantes? You must all be bereft of your senses if you can’t see where this will lead? I would not disagree that we need more of a deterrent on our roads and this may help that feeling that one is more likely to be caught out. They only need to stand near traffic lights for an hour and I have no doubt that at least a dozen drivers will be on the phone or texting. Other offences would be easily sighted and if on camera there could be good evidence in which to prosecute. May I also say that if as PC Stone mentions that they will be looking for a wide expanse of traffic offences and not just on the favoured 4. If they were to station themselves next to the lines of a GATSO camera working, or an old one and maybe no longer used then the lines on the road could be easily used to show those drivers that are following another vehicle by to little distance. If it were to be recorded there would be evidence for prosecution or at least a warning letter of the dangers of tailgating. The use of PSO’s and specials in this way gives them a purpose and a value and the bonus in extra safety on our streets. With some extra eyes on the roads to police them and hopefully with results. Something that I mentioned some years ago.